In stock at Global Industrial on 10-3-2018. 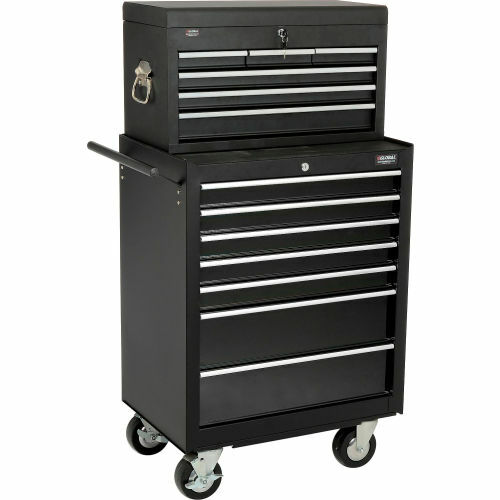 Global Industrial 6-Drawer Industrial Tool Chest is made of heavy gauge steel body with a durable powder coat finish. Top clamshell style lid allows full access to spacious compartment. High security lock with 2 keys secures all drawers. Drawers include aluminum drawer pull handles. Cabinet includes snap-in ball bearing drawer slides for smooth operation under heavy loads. Durable powder coat matte black finish ensures years of service. For 5&7 drawer roller cabinets, please see models 534153 or 534154.